Moray eels is a family of eel. Sometimes they are also called by their Latin name Muraenidae. Moray eels can be found all over the world. There are 200 different species in 15 genera. Typically, moray eels grow to a length of about 1.5 metres. The largest known moray eel is the Slender giant moray, which can reach 4 metres in length. Moray eels live in coral reefs and rocky areas, at a depth of about 200m. These reefs are usually in tropical or subtropical waters. They spend most of their time inside deep cracks in rocks. they are very dangerous and have big teeth Morays are carnivores. They prey on other fish, cephalopods, mollusks, and crustaceans. 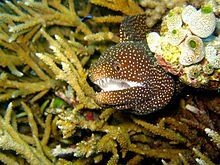 Groupers, other moray eels, and Barracudas are amongst their predators.They have razor sharp teeth which can pierce your skin. ↑ Froese, Rainer, and Daniel Pauly, eds. (2009). "Muraenidae" in FishBase. January 2009 version. Wikimedia Commons has media related to Muraenidae. This page was last changed on 26 September 2018, at 15:12.